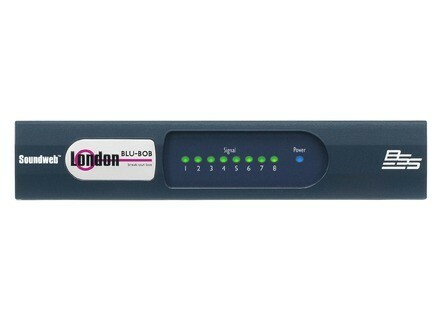 Soundweb London BLU-BOB1, Digital PA Controller from BSS Audio. The BLU-BOB features eight analog audio outputs on standard terminal block connectors and a 256-channel digital audio bus. This bus is designed to facilitate the creation of large, fault-tolerant, centralized matrices containing multiple devices, according to BSS Audio. The digital audio bus uses standard Cat 5e or Cat 6 cable, which enables a distance of 100 meters between devices. The BSS Audio MC-1 fiber optic media converter can be used to increase the distance between devices to over 10km (6.2 miles) using single mode fiber. A series of DIP switches on the rear of the BLU-BOB device allow consecutive channels, in groups of eight, to be selected from the digital audio bus. Multiple BLU-BOB devices can be configured to receive the same or different eight channel ranges. Signal present and power status are displayed by front panel LED indicators for monitoring and troubleshooting. The BLU-BOB devices are powered by an external 24VDC power supply such as the BSS Audio 999-PSU. Two chassis styles are available, the first (BLU-BOB1) is a half rack width, desk or wall mounted version and the second (BLU-BOB2) is a 19" single rack space version with mounting ears for equipment racks. Front panel indication and rear panel connections are identical on both versions. Each of the eight different Soundweb London devices offer a different mix of signal processing, CobraNet and digital audio bus functionality. For more info, visit www.bssaudio.com. XTA DP 426 Audio Management Tool British DSP manufacturer XTA Electronics has announced the latest addition to their 4 Series: the DP426. New QSC Installation Line Array v2 QSC has introduced its new ILA (Installation Line Array) v2 System. Carvin XD88 Extreme Drive The XD88 Extreme Drive is designed to provide controls for loudspeaker and EQ management.